The Sphinx Competition came to a close on Sunday night with a Finals Concert and announcement of its Junior Division winner, violinist Alexandra Switala, 16, of Grapevine, TX. The second-place laureate was bassist Xavier Foley, 16, of Marietta, GA and the third-place laureate was Annelle Gregory, 15, of San Diego, CA. The Senior Division first-place laureate, violist Paul Laraia of Boston, had already been named on Thursday, when he was named the only finalist. Sunday's concert was to have featured three Senior Division finalists who would have been competing for first place. 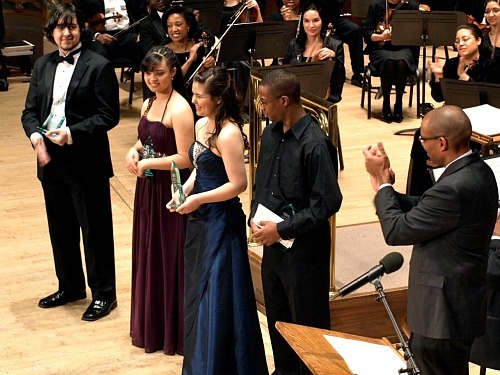 Instead, Laraia performed as the already-named Senior Division winner, and the three younger Junior Division finalists vied for first place in front of an audience of about 1,200 at Detroit's Orchestra Hall. The concert began with Annelle Gregory playing the first movement of Mozart's Violin Concerto No. 5 in A Major. I appreciated the good clean introduction played by the Sphinx Symphony Orchestra -- Mozart is no throw-together affair. The highlight was Annelle's elegantly-played Joachim cadenza. It's hard to make this oft-played cadenza sound spontaneous and original, but she pulled it off, with good pacing that made room for both high-speed runs and moments of time and space. Next up was Xavier Foley, performing the third movement of Dittersdorf's Concerto for Double Bass in E Major, which he did with great energy and a well-paced accelerando at the end that had the audience cheering and bringing him out for more applause. 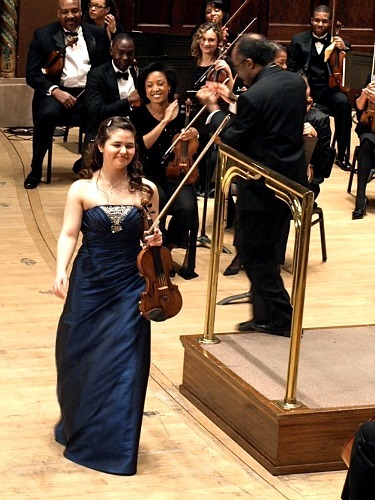 Alexandra Switala was truly in character for her Mozart Concerto No. 5. On Saturday, jury member Pam Frank had suggested in a master class that the character of the music should show in a performer's face, and Switala seemed to take this to heart. It was fun to see her out-of-the-ordinary bowings (for example, starting the Allegro aperto up-bow!) and her connection with the orchestra. As she had done on Thursday, she played Rachel Barton Pine's cadenza, and it was a big hit. Next came a performance of the intense and aggressive first movement of Ginastera's String Quartet No. 2, Op. 26 by the Catalyst Quartet, comprised of Sphinx Competition laureates and alumnni Bryan Hernandez-Luch, violin; Karla Donehew Perez, violin; Chris Jenkins, viola; and Karlos Rodriguez, cello. Senior Division first-place laureate Paul Laraia played the second-movement "Vivo" from the Walton viola concerto. He had mentioned to me that without the pressure of having to compete, he would simply go out and have fun, which looked like exactly what he was doing. And it's fun to watch someone having fun! He seemed to ride the wave of asymmetrical rhythms, with a clear projecting sound, and he had good support from the Sphinx Symphony Orchestra's brass section. Then came the presentation of awards. As the Senior Division first-prize winner, Laraia will receive a $10,000 cash prize, solo appearances with major orchestras, and a professional recording through the Naxos label. This year there were no second and third place, but Senior Achievement awards of $2,500 went to two participants, Maia Cabeza and Josue Gonzalez; and a Gold Achievement award of $4,000 went to Michael Casimir. Junior first-prize winner Alexandra Switala will receive a $5,000 cash prize, solo appearances with major orchestras, and a national radio debut on From the Top. All 18 semi-finalists will receive a scholarship to a summer program this year, and other awards and prizes are listed here. To conclude, the Sphinx Symphony Orchestra performed the larger-than-life Finale from a work commissioned by the Sphinx Organization, Sinfonia No. 4 by Roberto Sierra. It's a big, noisy piece of music, in the way that a happy family is big and noisy. No instrument is left out, everyone has a busy part, including a lot of brass. Earlier in the week the Puerto Rican composer said that when he writes a piece "it's infused with my nature. When I talk, I have an accent, and in my music, I have an accent. It's always there." And indeed, right away that accent came through, in the punctuation by the marimba, the very active harp, and in the way that something was always poking through the texture. My only regret was not being able to hear this movement in the context of the entire symphony. The performance received a long standing ovation. The part in black names the sponsor, and if you'll notice, nearly every chair is sponsored. 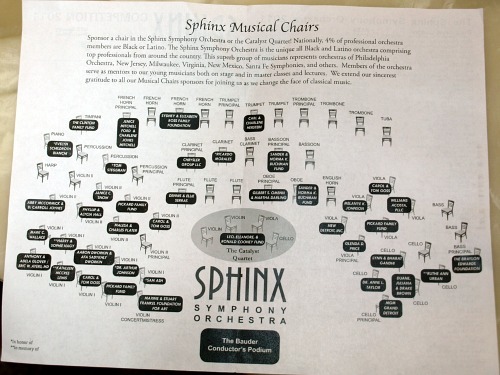 In addition to these "Musical Chair" sponsors, the program listed more than 300 more sponsors for Sphinx -- much of them coming from the Detroit area, one of the most economically hard-hit areas in this Great Recession. Throughout the week, members of the Sphinx Symphony as well as Sphinx competitors were asked to hand-write thank-you notes to sponsors, a task they took quite seriously. I can't help but think that drawing attention to the sponsors will help cultivate an awareness that not only do musicians need to take opportunities seriously, but they also need to create opportunities and nurture relationships that support classical music. That's a good lesson for all of us. Later in the week we'll bring you interviews with the first-place laureates, and a write-up of masterclasses with violinist Pamela Frank and violist Michael Tree. Thanks so much for writing about this! I hope to compete in that competition (the junior division) next year and am so excited to get a closer look at the experience. Sounds like it was an amazing group! That would be fabulous, Khelsey--keep me updated how it goes!